A few months ago we wanted to order some extra TC4 boards for our roaster. This board is an arduino shield that can handle 4 thermocouples and takes care of precise temperature measurement. During the order process we had a problem. We could not order them anymore from the mlpg-website. All the “order buttons” seemed to be disappeared and mailing them gave no response. But somehow the universe came with a solution. A few weeks ago we got in contact with Viliam from Slovakia. He also needed TC4 boards for his projects and he told us he had decided to produce the TC4 by himself. In case he was succesful we could order from him. 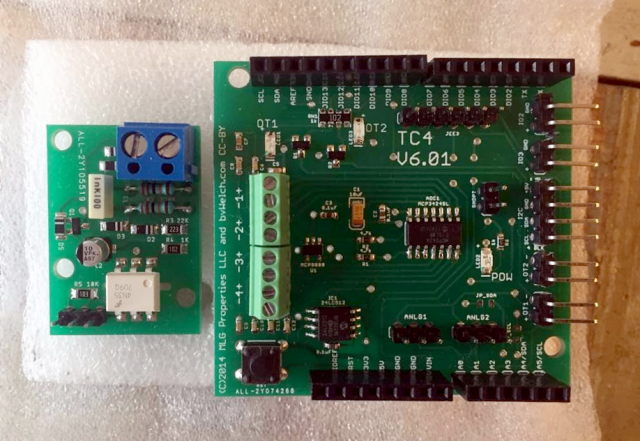 A few weeks ago he told us that he had succeeded and he would send us one of his first production TC4 v6.01 board and his Zero Cross Detector (ZCD). The ZCD is a device that detects the sine waveform transition which is needed to control the airflow of our AC Blower. Today we tested his boards and it all worked perfectly. Many thanks for Viliam to keep this valuable arduino shield alive! Another nice movie by Frans.